Steinbusch, Contents. Preface. List of contributors. I. Nitric oxide synthase and the production of nitric oxide (L.J. Ignarro and A. Jacobs). II. Histochemistry of nitric oxide synthase in the central nervous system (S.R. Vincent). III. Comparative and developmental neuroanatomical aspects of the NO system (J.R. Alonso, R. Arévalo, E. Weruaga, A. Porteros, J.G. Briñón and I. Aijón). IV. Nitric oxide in the retina (W.D.D. Eldred). V. Nitric oxide signaling in the hypothalamus (B. Woodside and S. Amir). VI. Nitric oxide systems in the medulla oblongata and their involvement in autonomic control (T.F.C. Batten, L. Atkinson and J. Deuchars). VII. Nitric oxide in the peripheral autonomic nervous system (H.M. Young, C.R. Anderson, J.B. Furness). VIII. The nitric oxide system in the urogenital tract (M.S. Davidoff, R. Middendorff). IX. Response of nitric oxide synthase to neuronal injury (W. Wu). X. Nitric oxide -- cGMP signaling in the rat brain (J. De Vente and H.W. M. Steinbusch). XI. Invertebrate models for studying NO-mediated signaling (N. Scholz J.W. Truman). 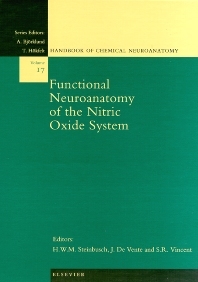 This volume of the Handbook of Neuroanatomy is concerned with nitric oxide synthase. In this volume different research areas are presented together, which adds up to the first major review volume on the localization of nitric oxide synthase in the nervous system. The subjects range from developmental aspects in vertebrates to a functional neuroanatomy of the nervous system in vertebrates. This presentation gives an impressive look on the overwhelming presence of NOS in animal organism and the significance of NO - cGMP signaling. By clearly stating the limitations of our present knowledge the book is also a stimulant for further research. This book presents for the first time an overview of NOS and NO-cGMP signaling in the retina and urogenital system. In addition the effects if injuries on the expression of NOS are summarized in a number of models, which has not been done before. The frame of the book is a classical neuroanatomic description of the localization of NOS. Several authors give detailed advice to prevent pitfalls which may occur when different methods to locate NOS are used. In addition, several chapters detail the target structures for NO while describing the localization of NOS at the same time. All these points together make this volume very timely, i.e. overviewing a decade of NO research. Department of Psychiatry and Neuropsychology, Maastricht University, P.O. Box 616, UNS 50, 6200 MD Maastricht, The Netherlands. Graduate Program in Neuroscience, Kinsmen Laboratory of Neurological Research, Department of Psychiatry, University of British Columbia, Vancouver, BC V6T 1Z3, Canada.